Perfect for hosting parties and movie nights, this 4-person theater seating has the comfort and convenience you need to make yourself at home. With each seat reclining to the angle of your choice, this sectional is great for kicking back and putting your feet up after a long day. From plump bustle wing backs to plush pad-over-chaise seats constructed of Dacron fiber and wrapped in bonded leather, this seating offers head-to-toe cushion and support that just begs to be touched. But more than just comfortable, this theater seating includes 2 console wedges, that not only angle the shape of this sectional for optimal viewing, but also provide cupholders and lift-top storage for eating and even working while watching TV. The Brady 5 Piece Home Theater at Belfort Furniture in the Washington DC, Northern Virginia, Maryland and Fairfax VA area. Product availability may vary. Contact us for the most current availability on this product. 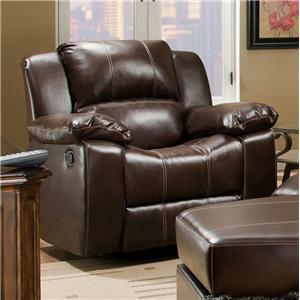 958080818 Right-Facing Recliner 1 32" 39" 39"
523391365 Left-Facing Recliner 1 32.28" 39" 39"
570337875 Wedge with Cupholders and Lift-Top Storage 2 26" 38" 37"
089740873 No Arm Loveseat 1 47" 39" 39"
Fabric Options Only available as shown. Seat Support Seating comfort utilizes 15, 8-gauge sinuous no sags per sofa. The ultimate home theater ensemble, the 18201 collection features comfort, convenience, and style all-in-one. Complete with 4-person theater seating, this collection is just what you need for hosing parties and movie nights. 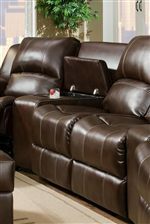 With each piece marked by bustle wing backs and pad-over-chaise seats constructed of Dacron fiber and wrapped in bonded leather, this collection offers head-to-toe comfort in addition to easy-to-use recline options. As a finishing touch, console storage, cupholders, and even casters on its ottoman, create a setting that will not only ease the body, but also the mind. 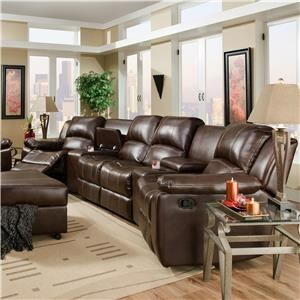 The Brady collection is a great option if you are looking for Casual Casual Casual Casual Casual furniture in the Washington DC, Northern Virginia, Maryland and Fairfax VA area. Browse other items in the Brady collection from Belfort Furniture in the Washington DC, Northern Virginia, Maryland and Fairfax VA area.